UK graphic designer/illustrator Hush opened up his solo show, entitled Veiled Beauty, last night at FIFTY24SF Gallery in San Francisco. The exhibition featured a healthy amount of new paintings inspired by graphic-novels, animation, graphic-design, graffiti art, urban art and contemporary painting. 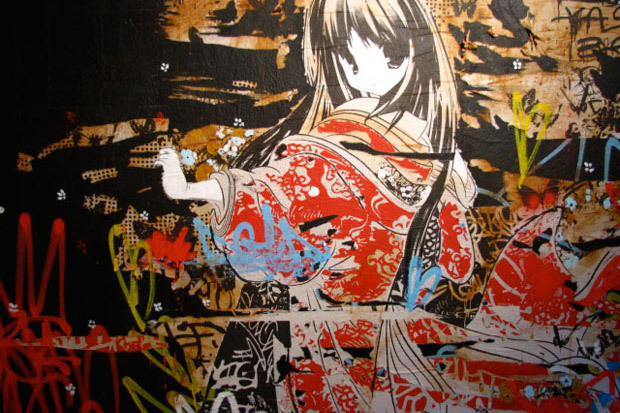 Of course the Manga influence is clearly present with his female characters juxtaposed along mixed media layering techniques including spray paint, paper and screen print. Having already sold out shows in Los Angeles and New York, Hush brings his artistic mastery to the city by the bay for a short period. Veiled Beauty will remain open to the public until the 26th of this month.